In La Croix, Jan 2019. Since his election, Pope Francis has continued to insist on synodality as the principle of Church governance. To better understand this notion, the Bishops’ Conference of France (CEF) recently brought together 30 people interested in improving co-responsibility in the Church. Although no formal definition of the term exists, some theologians are now proposing to make it the founding principle of co-responsibility in the Church. This is because “all are responsible for it but not in the same way,” according to theologian Arnaud Join-Lambert, a professor at the Catholic University of Louvain in Belgium. Join-Lambert was addressing a seminar on synodality organized by the Studies and Projects Committee of the Bishops’ Conference of France in mid-December. Synodality, which was emphasized by Vatican II, has again come to the fore in the form of the pastoral governance that has become characteristic of Pope Francis’ pontificate. In October 2015, during the 50th anniversary of the Synod of Bishops, the pope also called for synodality to be developed at every level of ecclesial life. 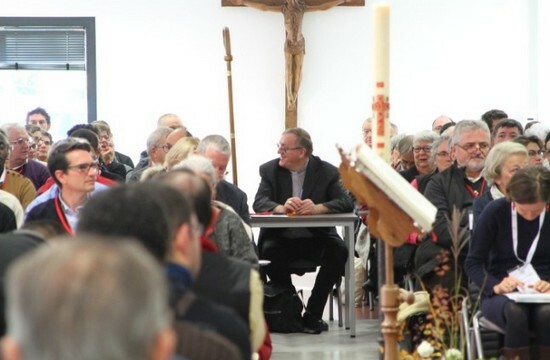 “The call for progress in consultation, mutual listening, gathering experiences and the desire for shared mission extends to all levels in our Church,” said Archbishop Laurent Ulrich of Lille, president of the Studies and Projects Committee. Thus, it was with a view to improving the synodality of the Church in France that participants shared their experience of mutual collaboration, including at diocesan synods. Since Vatican II, these synods have become a major reference for reflecting on synodality along with the general chapters of religious congregations or new communities and even the synod of bishops in Rome. Nor should other institutions be ignored, including episcopal councils, presbyteral councils or diocesan pastoral councils, which are also “the concrete and ongoing expression of diocesan synodality,” according to Join-Lambert, a specialist on the synodality of the Church. “Synodality is not an objective in itself but a synergy in view of a mission,” said Archbishop François Kalist of Clermont, who has never organized a synod during his ten years as a bishop although he has participated in several at Bourges, Orleans, Blois, Nevers and Rouen. As bishop of Limoges and Clermont, Archbishop Kalist also established “places of synodality” advancing decisions taken by his predecessors following diocesan synods. “A synod launches a process of spiritual and human transformation and is a time of conversion,” said Lucette Perroud, secretary general of the Rodez synod, which has mobilized 230 local teams made up of nearly 2,200 people including 200 people elected to the synodal assemblies. Several pathways have been proposed for improving synodality, e.g. the development of a “national pastoral council” to work on issues prior to the plenary assemblies of bishops. Along with others, these proposals will be presented to the Permanent Council of the Bishops’ Conference of France over the next few days. A certain level of urgency has now emerged for implementing an everyday form of synodality that will answer the pope’s call and enable current issues to be tackled.